Defining moments are all a part of our lives. Those moments when a conversation or an action happen that truly make you change course, take a new action or wonder what the crap you are doing. We all have those kind of moments in our life and we decide whether or not we are going to act or ignore the impulse. My life has been full of this kind of moments. These experiences have made me who and I am and are even defining my future at the same time. These moments have been great joys like my marriage to Robin or all three of my kids being born. Others have been great sorrow and even hurts like lost jobs, closing a church, losing a home or losing a mother. Now some of these have invoked some anger, bitterness and even shame in me that I still struggle with today. What I realize is that those can be healed but God, time and taking each day on its own is the best way. I say all this to say that even being a pastor my life is not perfect and the struggle can be real. These defining moments or divine appointments happen on a regular basis. I am going to be open and honest here. One of the more recent struggles or defining moments was the ministry I serve in by the grace of God. It is called Thrive. We started this amazing journey thinking and praying for it to be a great, successful, experiential worship service where people of all ages, genders and cultures could share a meal and worship under one roof. What we realized is that, that vision was not God’s vision for the ministry but our own thoughts and ideals to push a defining moment into reality. God was setting forth a bigger vision for the ministry than anyone could express or see. I still struggle to see it all and I am on the ground floor. Now I love what I do but the hurt I experienced in cancelling the service really hurt. Really hurt…I’m not sure I have fully recovered from it yet. There are still a ton of sleepless nights asking God what did I do or where did I go wrong. There are also those sleepless nights over God what are You doing and how can I just be an instrument over what You are doing? I haven’t quite got it all figured out yet. I also have to struggle past the hurt in order to see the God defining moments in why certain things happen as well. This will and always will be a defining moment in my life. The choice of leaving a church in Georgia (which hurt a ton) to cancelling this service to go a new direction is all a defining moment. It will either strengthen me or beat me up for a long time. (Honestly, I am praying for the first) You see in the midst of all this…my heart aches for the church and for the people the church hasn’t reached “yet…” Our communities are full of people with hurts, struggles, pain, sorrow and honestly not as much joy as one would hope. I say this while eaves dropping on some conversations in a food place. (Lots of hurts) Those are defining moments in the people’s lives and it is not any different than yours or mine. Those stories……man…those stories….strengthen us or beat us up….I’m tired of the bruises in my life, other peoples lives, our communities, people’s homes..… I hope they turn into GOD defining moments that when we all look back we see God’s amazing grace and mercy. God of ALL hope bring healing and hope to our defining moments. Let us see you in the midst of the struggles, the pain, the questions, the doubts and the worries. 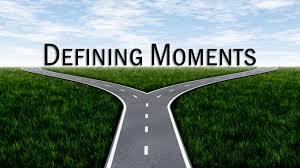 Let those defining moments become, defining revelations of Your glory in our lives. Amen.